Bart sues the comics industry in Bart Simpson #77! 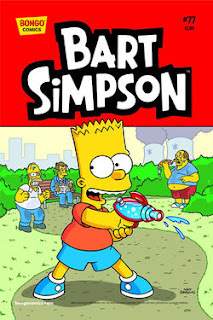 As mentioned a few weeks ago, I'm contributing stories to the Bongo Comics Simpsons line — and my latest story has been slated for Bart Simpson #77, shipping in November. Anyway, the just-announced issue #77 includes a story by Simpsons veteran Ian Boothby and my own "For A Limited Time Only." In my story, Bart teams up with a savvy lawyer to take the comics industry to court — in a tale longtime comics collectors should appreciate! I'm just back from Star Wars Celebration, but there's still a lot going on — I'll be the guest Thursday on "Route 51" on Wisconsin Public Radio, airing from 4 to 5 p.m. and available later as a podcast. With the Intrepid Meredith along with her trusty camera, I actually managed to get some pictures this year. Check out my Facebook feed for some more -- the blog interface isn't much for displaying a lot of photos. 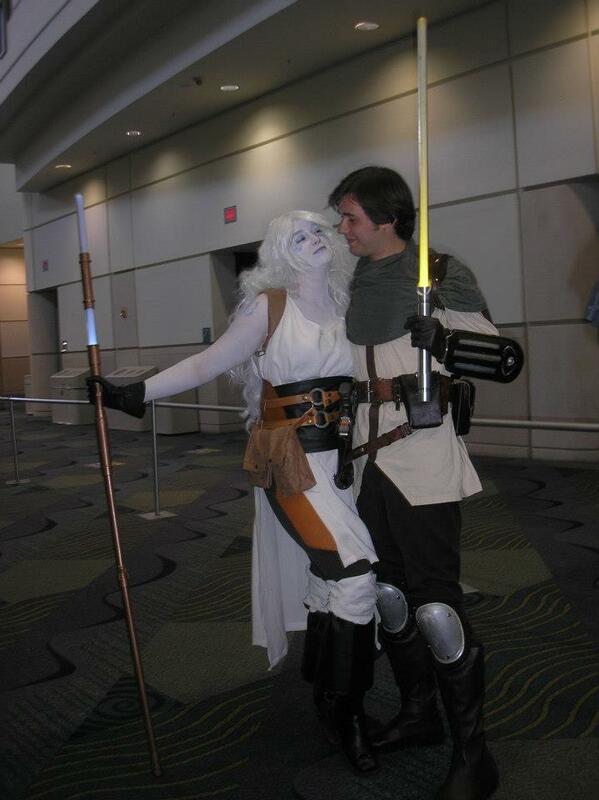 As you might notice, frequent Zayne costumer Peter White had some backup this year, with Deez Wallis as Jarael. 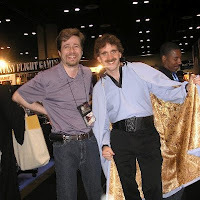 And Star Wars editor Dave Marshall got into the act, too, donning the cape of Lando Calrissian! Later on, we had a Kerra Holt sighting. Always nice to see some comics characters! 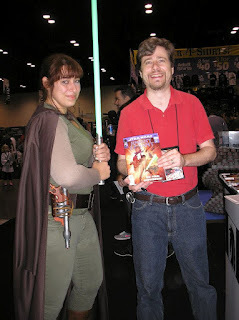 The timing of the event was fortuitous, as it hit just after the release of the Star Wars: Lost Tribe of the Sith -The Collected Stories book and Star Wars: Lost Tribe of the Sith - Spiral #1 comic book; we had a special limited edition of #1 at the show from TatesComics.com. The signings were a lot of fun -- I signed with Timothy Zahn at the Barnes & Noble booth on Saturday, and then the whole Del Rey crew on Sunday. 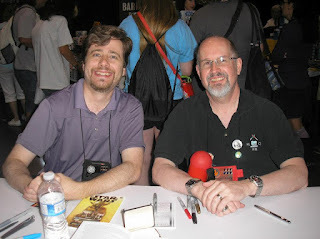 There were also great signings with Dark Horse and a couple of fun panels. It was a blast -- ready now for Celebration VII! 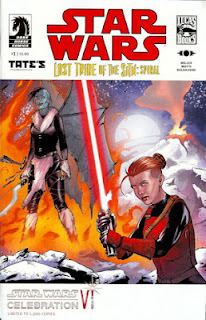 TatesComics.com will be selling a Lost Tribe of the Sith - Spiral #1 variant at the convention; it is limited to 1,000 copies. Dark Horse will also have a Lost Tribe mini-print available at my signings, and Del Rey will have its Sampler at its signing. As you might have noticed, I am at a panel for the first half of the Sampler signing on Sunday — but if you miss me at the opening you can catch me at the end or during the later Dark Horse signing later in the day. Be sure to follow me on Twitter to keep up with any changes. Looking forward to seeing everyone! 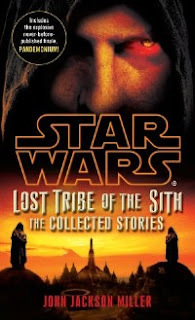 Given that some of the stories in Star Wars: Lost Tribe of the Sith - The Collected Stories had been downloaded for free many thousands of times over the years, one might have wondered how the print edition would fare. I am pleased to report: pretty well. I have just been informed that the book has already gone through its second printing and that a third has been scheduled for later in the month! I'm not too surprised, as the number one question people always had about the stories was "When's the print edition coming out?" I think a lot of people are like me: While I'm "platform agnostic" as a writer — I've written for print and online delivery, for magazines and books — I'm a bibliophile. I like to have the physical book on the shelf. Of course, it's available digitally, too — the collected edition is also available for Kindle and other devices. (For a second week, it's the #1 SF anthology on there.) But I'm glad we were able to have both digital and print formats — more choices are always good. I'm thrilled people are finding them. 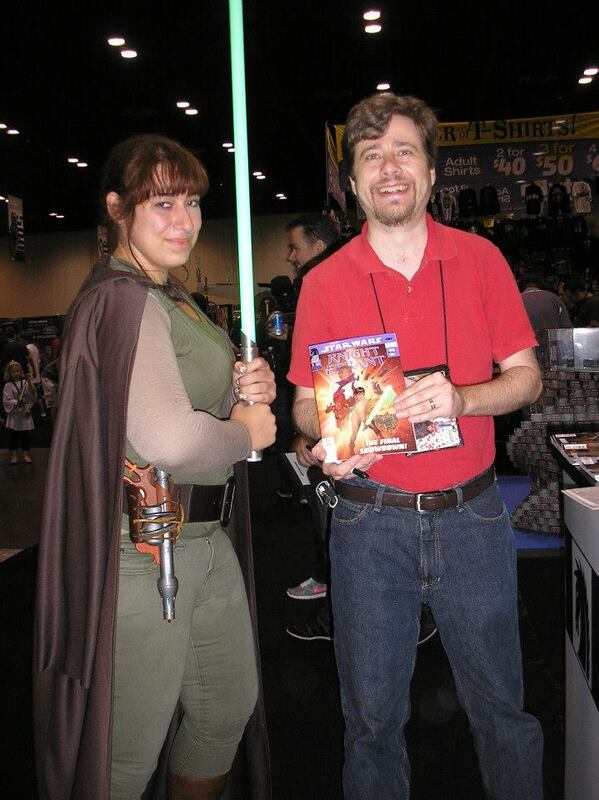 As noted here, the Lost Tribe of the Sith comics series has just started in the last 24 hours. Great timing — and a good time to check out more of the Tribe's adventures! The summer of George — and some novel news! Two big comic books out Wednesday! Star Wars: Knight Errant – Escape #3 continues to carry Kerra Holt toward her greatest confrontation of all — it's a barn-burner featuring three armies, no waiting. 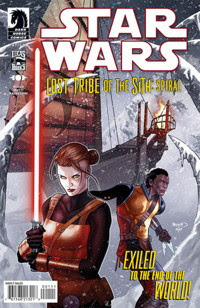 And Star Wars: Lost Tribe of the Sith – Spiral #1 picks up where Star Wars: Lost Tribe of the Sith – The Collected Stories (available now!) left off, putting some faces to some familiar names! On top of that, I have a Facebook chat on Del Rey’s Star Wars Facebook page Wednesday at 3 p.m. EST — and my first two events have just been announced for Star Wars Celebration, which I'll be attending in a couple of weeks. 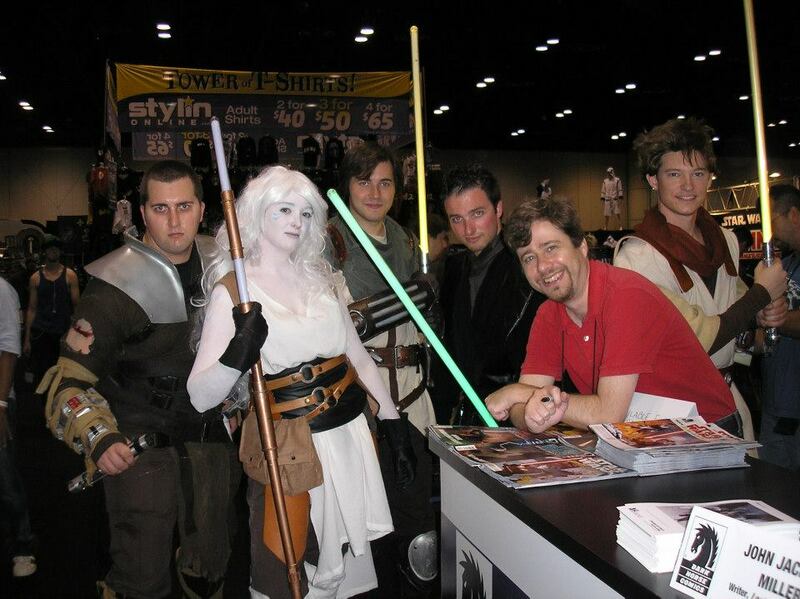 As they say on Seinfeld, it’s “the summer of George” … Lucas projects, that is! It's been a pretty busy year overall, by my standards — by the time it ends, I’ll have had a prose anthology, several collected editions, and at least 19 comic books released. Fifteen of the comics are Star Wars issues, which, if not a record for the license, is definitely a bunch. 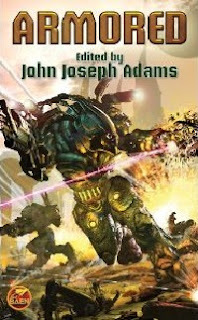 And 2012 has also already included the publication of my first creator-owned prose story, in the Armored anthology from Baen. But some things I’ve had cooking on the back burner are finally bubbling — and so this has also been a very different sort of year when it comes to my writing output. “The year of John,” my overworked proofreader wife jokes. In addition to the licensed work, I've adjusted my schedule this year so I could finally devote serious time to some of these personal projects — including, I am pleased to say, my first original science-fiction novel, well underway. And that’s just one of several things moving ahead on that front! What's that? Tell you more? Believe me, I’m bursting to — but I’ve talked with enough other authors to know things come out faster when you save the words for the page. So while I may not have to be as cagily vague as I am when discussing things in someone else’s sandbox, I’ll try to mind the “no snacking before dinner” rule here, too. While I wanted to share a little of the big picture now, the real fun’s in the details to come. All right, then. For now: dropping by my Facebook chat tomorrow, two comic books to pick up, scheduling time to catch my Star Wars Celebration panels — and a couple of podcasts coming up for you to listen to. Boy, it sure seems like I’m giving you odd jobs, doesn’t it? See you there!